It may have taken 90 years, but New York City’s cabaret law—which effectively bans dancing in bars and clubs around the city—is finally on the cusp of being repealed. 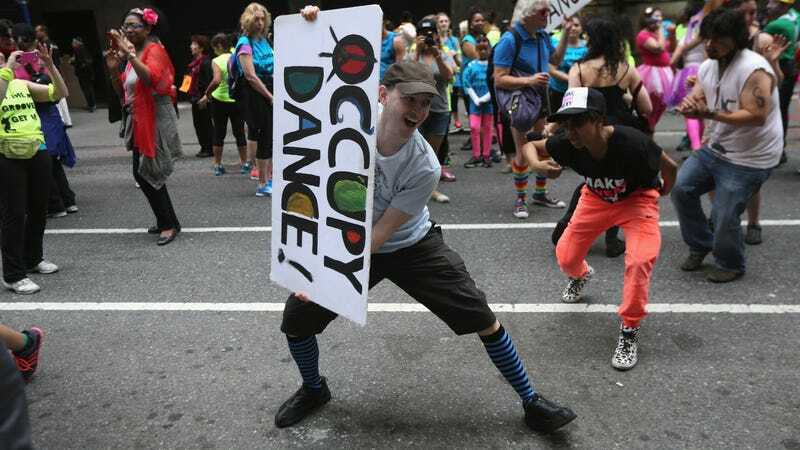 The City Council is expected to vote in favor of abolishing it on Tuesday, following a years-long battle by activists, politicians, lawyers and even one former mayor keen to put an end to a Jazz Age edict originally penned to keep black and white people from dancing together. But repeal of the law—which prohibits dancing by three or more people in any commercial establishment where music is played—is indeed only a first step, since the real challenge lies in augmenting the city’s zoning laws. If the repeal passes on Tuesday as expected, dancing will still be legal only in the city’s commercial manufacturing districts, known as Use Group 12. It’s not a small area, as you can see from the map below (UG 12 is marked in blue), but it certainly doesn’t include the city’s essential entertainment corridors, like the Lower East Side and the East Village. But Andrew Muchmore, a lawyer and owner of the bar Muchmore’s in Williamsburg, suspects the issue of zoning will ultimately be a relatively minor problem. Muchmore, who in 2014 filed a lawsuit in attempt to have the cabaret law ruled unconstitutional, attributes tomorrow’s (probable) victory to a sustained effort from grassroots organizations and the refusal to let it be brushed under the rug as it has so many times in the past. He said he intends to drop his lawsuit for now, though if progress isn’t being made on resolving the zoning amendment in the next year, he will file fresh paperwork and have it revived. “I guess we’ll see if it’s a theoretical issue or a real issue once the cabaret law is repealed,” he said. The bill currently has 24 co-sponsors in a 51-member council, and Espinal predicts support will be unanimous. The cabaret law has long been a bête noire for anyone who loves to dance, since it requires bars and night clubs to have a nearly-impossible to obtain cabaret license. Of more than 25,000 eating and drinking establishments in NYC, only 97 have one, thanks to a raft of absurd requirements like mandating proprietors be up on their child support payments. Though the law technically applies to a number of institutions like churches and ballet studios, it’s unevenly applied, with establishments frequented by people of color disproportionately targeted and shut down, Muchmore argued in his lawsuit. Written in 1926, the law was forgotten for decades until the ‘90s, when the Giuliani administration revived it as a means of targeting places it considered harmful to New Yorkers’ “quality of life.” Many efforts to revoke it have been made over the years to no avail, largely because of its value to police and other powerful agencies who have employed it as they see fit. For decades, the city also required performers to have clean criminal records in order to obtain a “cabaret card,” disqualifying such luminaries as Billie Holiday, Thelonius Monk and Charlie Parker. That aspect of the law was only rolled back after Frank Sinatra refused to sing in New York until the restriction was lifted. Espinal, the council member, said that in an era where controversial statues are under review for removal, now’s a fitting time to scrutinize repressive laws and re-evaluate their use.